Whenever Harold “Shot” Jackson was tinkering in his workshop, he did not fret — in any sense of that word. He clearly reveled in playing his steel guitar and dobro on stage at the Grand Ole Opry with artists such as Roy Acuff and Kitty Wells, and, noodling around, envisioned all kinds of sonic innovation, installing string pullers with pedals on Fenders and Rickenbackers to bend a note in sly, unconventional ways. So high-lonesome went high-tech as the pedal steel enhanced the music’s range of expressiveness while smoothing and polishing its rougher “hillbilly” barbs to a tear-stained gleam. Porter Waggoner became the first spangled headliner to use a Sho-Bud, and then Webb Pierce went wild with it. Soon enough, Shot Jackson was crafting, customizing, and refitting instruments for Roy Clark, George Jones, Ernest Tubb, and anyone else who drifted into the Sho-Bud music store on Broadway, trailing sequins from the Ryman Auditorium next door. Shot Jackson’s sons expanded the business, adding coveted features and gadgets. In the late 1960s, David patented a new pedal device that would become the most replicated string-pulling mechanism in the guitar industry. He operated Music City Manufacturing Company, where his older brother, Harry, built most Sho-Bud steel guitars, while their dad transformed the dobro into the “Sho-Bro” and worked on other nifty projects upstairs in the shop. Today, Willie Nelson still plays “Trigger,” which the elder Jackson repaired and customized for him, and, in Branson, Buck Trent dazzles tourists with the pedal banjo that he acquired in the early ’60s. Shot Jackson’s instruments not only made history; they have endured it “on the road” and everywhere else. “My dad was a mechanical genius who absolutely loved — lived and breathed — music,” David says. Pedal steel eventually infiltrated rock ‘n’ roll — Eric Clapton and the Eagles took up Sho-Buds — and found a jubilant home in the Sacred Steel tradition of gospel music, an African-American Pentecostal movement that originated in the House of God Which Is the Church of the Living God the Pillar and Ground of the Truth Without Controversy. In 1981, Gretsch-Baldwin bought Sho-Bud, and, later, Shot Jackson sold his repair shop. A couple of months after retiring, he suffered a stroke that impaired his speech and left him unable to play music until his death in 1991. The master inventor — whose handle was a truncated version of his childhood nickname in South Georgia, “Buckshot” — was inducted into the Steel Hall of Fame in 1986. “I’m not 100 percent sure about this, but I believe the Jackson family claims more patents in the business than any other,” David says. And they are not finished. Before these developments, David had worked on touring vehicles for musicians. During a bus repair, he met his current wife, Susan Peck, who sings with her sister in the award-winning gospel act, Karen Peck and New River, based in north Georgia. In 2005, he unveiled the next generation of instruments, a Jackson Steel guitar, at the band’s annual homecoming celebration in Dahlonega. Along with his prayer-driven creativity, he was inspired by his daughter’s growing interest in music. Another Jackson with a dual flair for science and the arts, Dawn had studied biology at Mercer University and then worked in the health-care industry, but in 2002, she founded Sho-Bud Music Inc., an indie record label and publishing company. (Its first single, “Beer on the Table” recorded by Josh Thompson, went to No. 17 on the Billboard charts.) She handles sales and marketing while writing songs and working on a documentary about the Sho-Bud dynasty. Her uncle Harry who still lives in Nashville, does metal fabrications, manufacturing, and development for the company. “Word is out that the Jacksons are back in business!” David says. 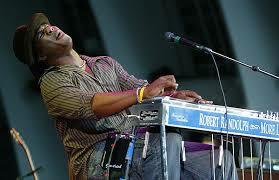 One of their hippest exponents is Robert Randolph, who grew up in Sacred Steel and now plays R&B. “In my church, the pedal steel guitar substituted for the organ,” he says. “I wanted to do with it what Stevie Ray Vaughan and Jimi Hendrix did.” Randolph was working with T Bone Burnett on last year’s much-praised release, “We Walk This Road,” a jukin’ celebration of black roots music, when he called up the Jacksons to request more instruments. It is one of “pure emotion,” Dawn says.